Today Kashmiris are commemorating the 26th anniversary of the Sopore massacre. Genocide has a long memory which cannot be laid to rest without justice. This post explains what happened in Sopore on January 6th, 1993. January in Kashmir is also referred to as the month of massacres, for it has in the past witnessed some of the biggest and most brutal massacres carried out by the Indian occupation forces against the civilian populace of Occupied Jammu and Kashmir. As with all other human rights abuses and crimes against humanity, none of the perpetrators of the massacres in Kashmir has been brought to justice or held accountable. Today is the 26th anniversary of one of the ‘January Massacres’ which was carried out against the unarmed civilian population of Kashmir. Sopore Massacre, 1993. Figures: 57 killed. 400 shops burnt. 75 houses detroyed. 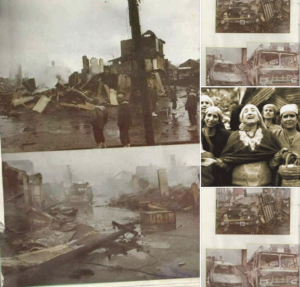 Attached below are pictures from the archives, depicting a small portion of the aftermath. This is an additional article about the massacre by Faizan Bashir: https://m.kashmirobserver.net/2019/opinion/6-january-1993-remembering-smouldering-sopore-39249?